A Victorian-era thriller about a young apprentice hat maker who, driven by his affection for a local flower peddler, creates an exquisite hat, despite his master's warnings. 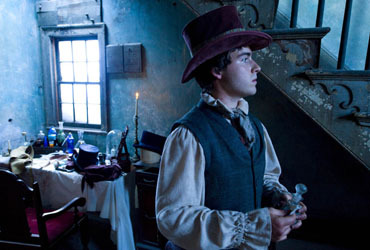 Synopsis: William (Bud Simpson), a young and eager shop attendant, works in the magnificent world of chemicals and artistry as a hatters apprentice. A sweet but timid boy, he constantly toils away under the tutelage of his master (Lanny Thomas), a man of ever-changing, and possibly dangerous moods. Inspired by his feelings for Sophia (Sydney Jacobs), a pretty young flower girl, William decides to ignore his own inexperience and the Hatters ominous warnings to create a hat of his own. Initially, the young apprentices efforts prove successful, and his beautiful, almost magical creation seems to grant him his every wish: love, status, respect. He enjoys its benefits by taking the lovely Sophia out for a romantic moonlit date. He woos her and successfully earns her kiss. The hat is every bit as glorious and rewarding as he imagined. However, William soon learns the dangers of overreaching, as his glorious dreams of fame and romance turn into chilling nightmares. He begins to have horrific and haunting visions of the Hatter, the Victorian world around him and even Sophia. Running through dark forests, he tries to flee the Hatters ominous taunting. Now, William must escape the dire consequences of his actions before he and everything he has ever dreamed of is destroyed.